October 2014 and the weather is having a field day. We on the other hand are not. Don’t get me wrong, people are out, and riding hard, but bringing the outdoors back indoors with us isn’t what we, nor our families have in mind. The amount of times we’ve returned home, only to be thrown a towel and instructed to go back outside to dry off, because we’re dripping wet, isn’t the heroes welcome we’re all hoping for. And so the search begins for an alternative for foul weather clothing. 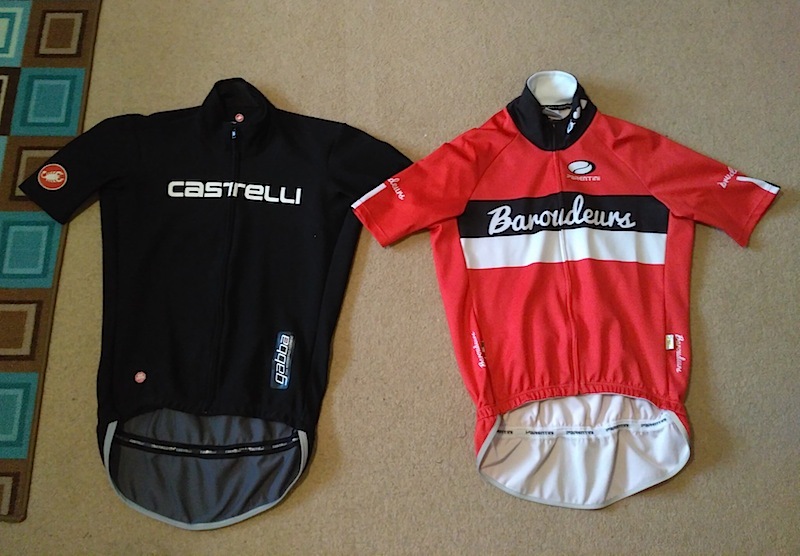 For the past year or so, the Castelli Gabba has compelled many of us. 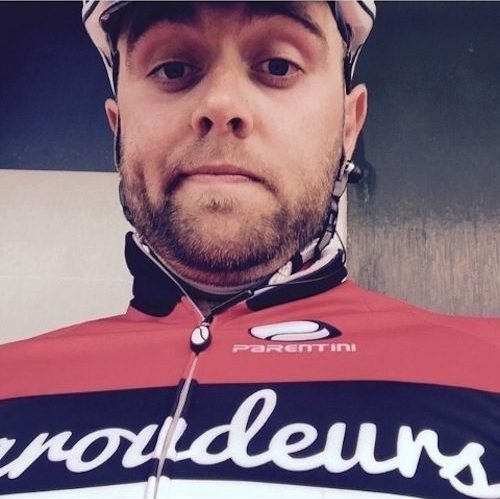 It’s background story and its presence in the pro-peloton is a strong argument for its adoption. 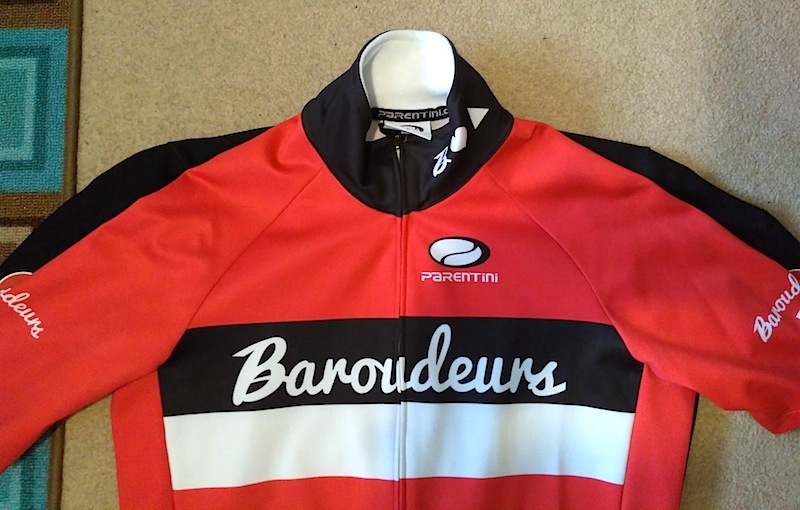 A number of characteristics also make it popular amongst the Baroudeurs: firstly it does what it claims to do – protect you better than a standard jersey; it fits beautifully whatever your shape; it comes in a variety of cool hues that match our team colours – and despite what everyone may say, black is badass – the reflective trim, and white and red detailing can’t be ignored by either motorist, or fellow cyclist. 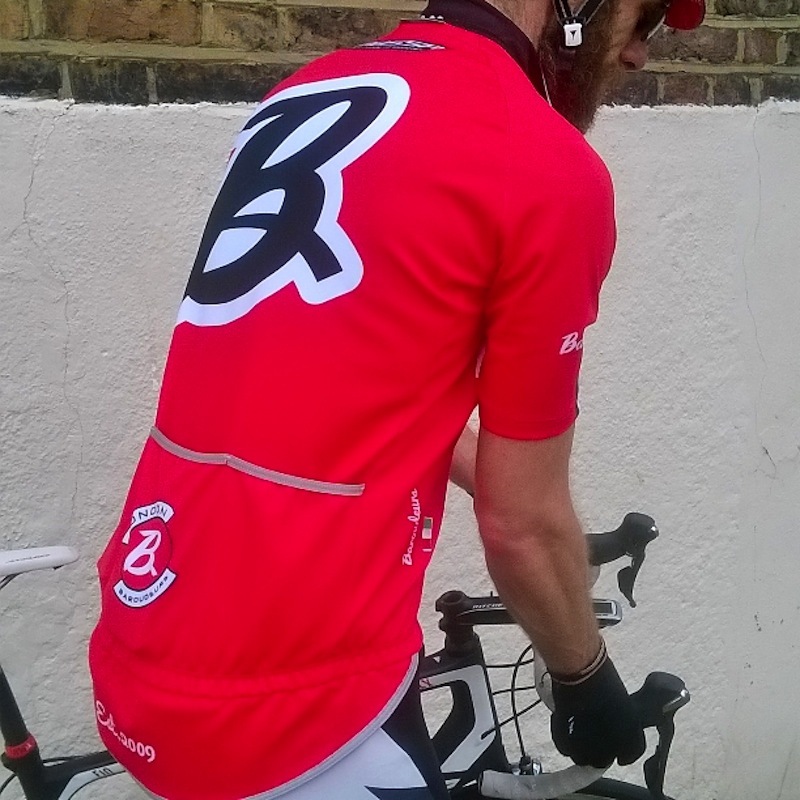 The Gabba – well thought through, tough and cool, this could be it; the jersey that says as much about your approach to cycling as your choice of bicycle. But if you’re like me, a stubborn one, you start questioning: why isn’t it waterproof? Why can’t you get it customised? Is there an alternative? Enter the Parentini Mossa. Before we continue, one thing to note is that 10 members of the team currently use the Mossa; with 4 of us owning both the Gabba and the Mossa. All of which, we’ve paid for from our own pockets. As such, we think it’s only fair that this review be put together by as many of us as possible. It will give frank opinions from people of different sizes, genders, who all love riding and racing their bikes. At the time, our team kit maker were open, saying they didn’t have a jersey that could compete with the Gabba – which is a shame, as Velotec continue to be our choice supplier. On the other hand, Castelli seem to only supply Gabba’s to either pro-teams, or those sponsored in the US – their Euro custom site currently show 10 jerseys options, none of which include the Gabba. 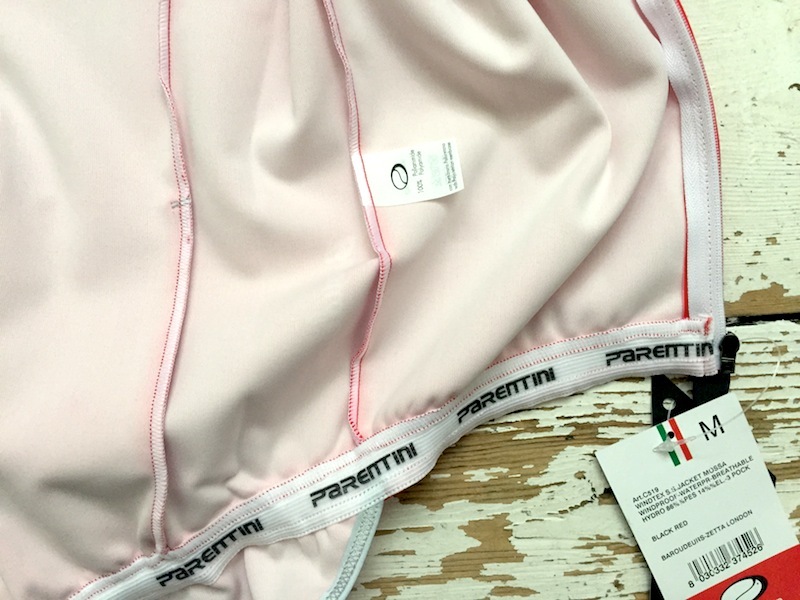 Then we got an email from Ali at Zetta Distribution, who is the main dealer for Parentini in the UK. His introduction of the Mossa got us talking. Expectations are high, as Parentini claim that their Mossa is everything we have hoped for in the Gabba, and more. Namely, it is waterproof! You can tell Ali is passionate about the range of products he represents. The humble jersey is no less important to him. We talk from January through to April 2015 to get things just right. 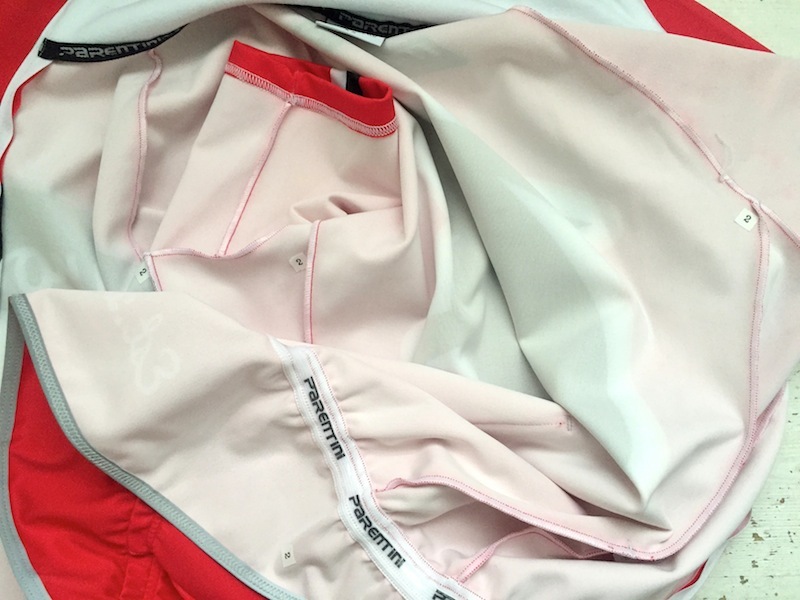 He describes the Mossa as the “Gabba slayer”; revealing that the Mossa’s difference is in both the way the Windtex Storm-Shield material is used and how the jersey is cut. As many cyclists before us know, Windtex has been around for some time, but has failed miserably in living up to it’s expectations. What previous developers had failed to realise is that by ‘messing’ around with the fabric, the material’s much sought after properties were being considerably reduced. And so the makers, Vagotex now insist that developers agree on production techniques that allow the material to perform the way it was designed to. Parentini, realising the opportunity, are one of the first to agree to practice this, and as a result have come up with the Mossa. So that’s what they tell us, but let’s take it out on the road and see. Crazy Legs and the Bear – anyone else out there? Upon opening, the colours and sublimation instantly pop with quality. All the details are clear and plush. Unlike other products, there’s no stick-on motifs, or silly prints that will eventually peel off. However, they haven’t got our shield on the rear pocket exactly right – a surprise really, when our design-proofs and the ‘B’ everywhere else makes for a good reference. As for feel, the Windtex fabric is far removed from the Gabba. 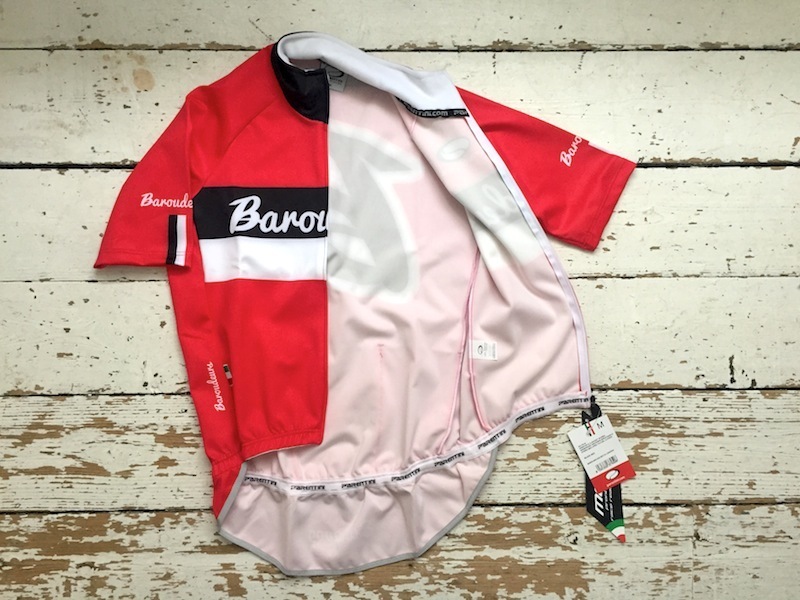 Where the Castelli jersey is spongy-smooth, the Parentini offering is silky-smooth, super stretchy, and thin as a summer jersey, that you can’t wait to put it on. 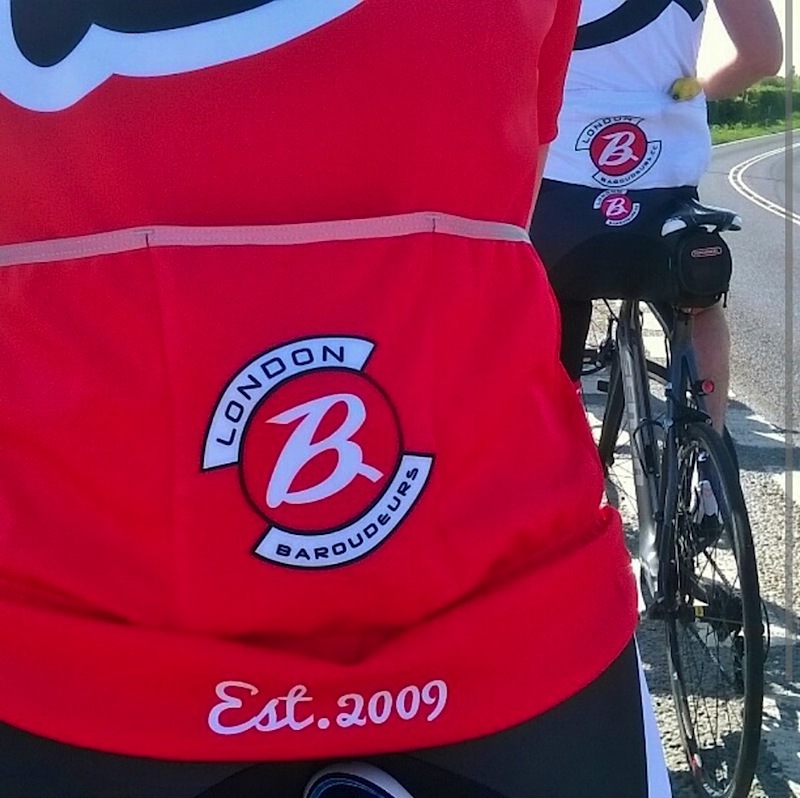 Like never before, sizing has become somewhat of an obsession with cyclists, and the cycling jersey is no exception. Once on there’s a noticeable difference to the Gabba. How can we not compare? The Gabba is snug, fitting, and flattering. Whereas, the Mossa feels reassuringly light, but immediately wide and short – wide under the armpits and short in the front. We’ve been informed to expect this, but all the same, it feels disconcerting. We understand that this is to avoid ‘bunching’, particularly when in the tuck position, but you feel your tummy is excessively exposed. And more so when you find yourself walking around in public, because we’re not always going to be on the bike! And this is where we have a difference in opinion. When you look around, many people have questioned the cut, and although we were told that Parentini would extend the length of the front, this did not happen. What’s more, none of the reviews currently out there talk of the excessive tapering from armpit to waist. Is it just us? You’d need to be sculpted like Hercules to make this work. Personally, I would happily sacrifice the cosy high neck for a longer length on the torso, but why should we have to sacrifice when ordering custom? It is curious to see that their version 2 offering looks very similar to the cut of the Gabba that we believe to be an ideal fit. 97cm chest = a medium? Is ths short tail long enough? 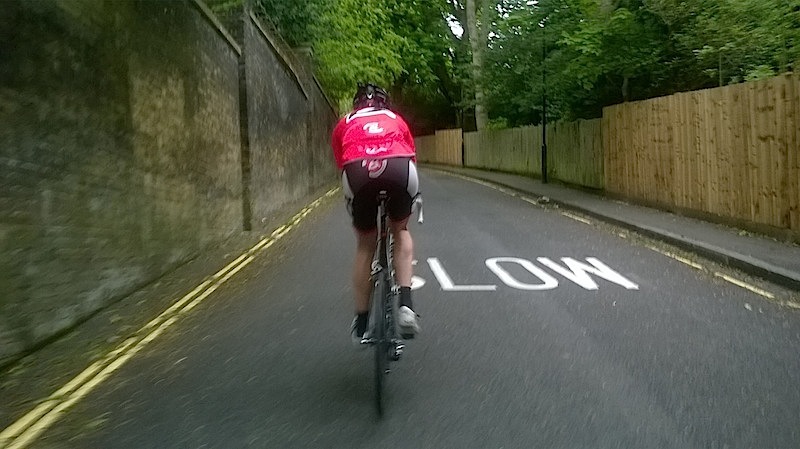 Okay, that’s when you’re standing; on the bike it’s a different matter. You couldn’t get more different body shapes than the Captain, who is tall and slim, and Disco, being short and stocky, but both found the Mossa to be loose and flappy where it really shouldn’t be; up front, and around the armpits, when in the tuck. 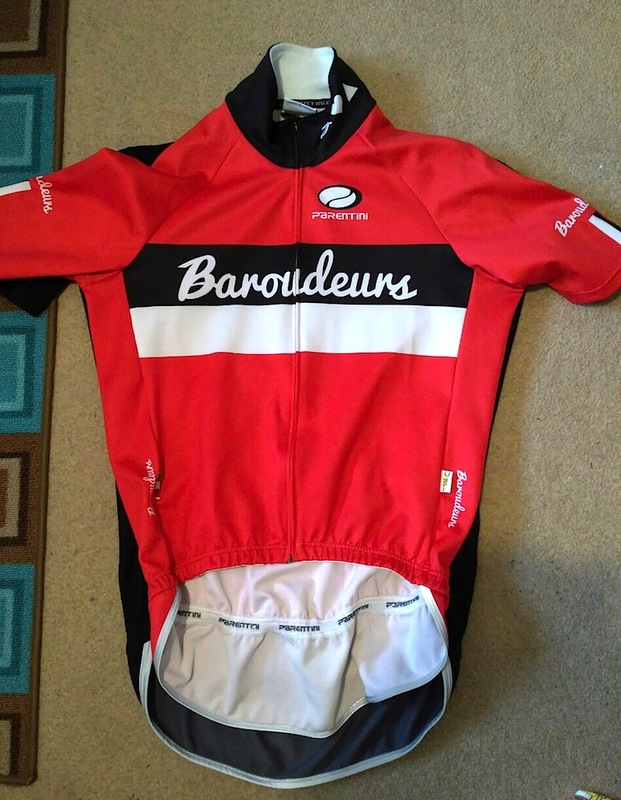 No matter what size we tried, we didn’t get that satisfying feeling you instantly get with a good fitting jersey. Consolation came from all places, the clever rear storm flap. Some would say it’s too short, but unlike the Gabba, which often snags on the saddle, many of us found it to be just right on the Mossa. We still wanted to see if our investment was worth it when riding in the conditions it was designed for. And so we waited for the rain. 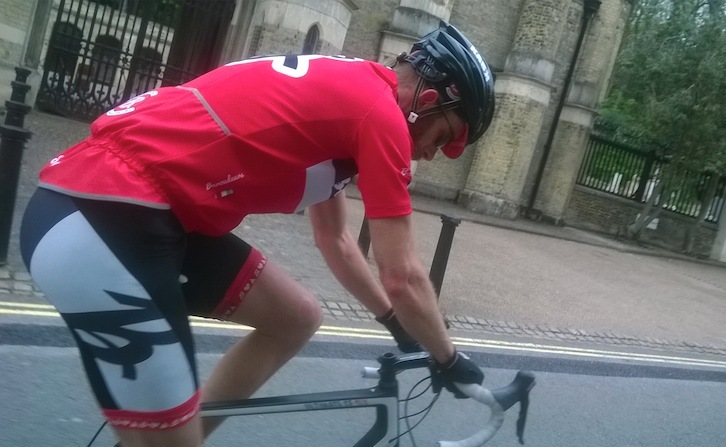 “The Gabba has a rather broad cut for the shoulders whereas the Mossa slopes down. You’ll see that quite clearly where I’ve overlaid the Mossa over the Gabba. 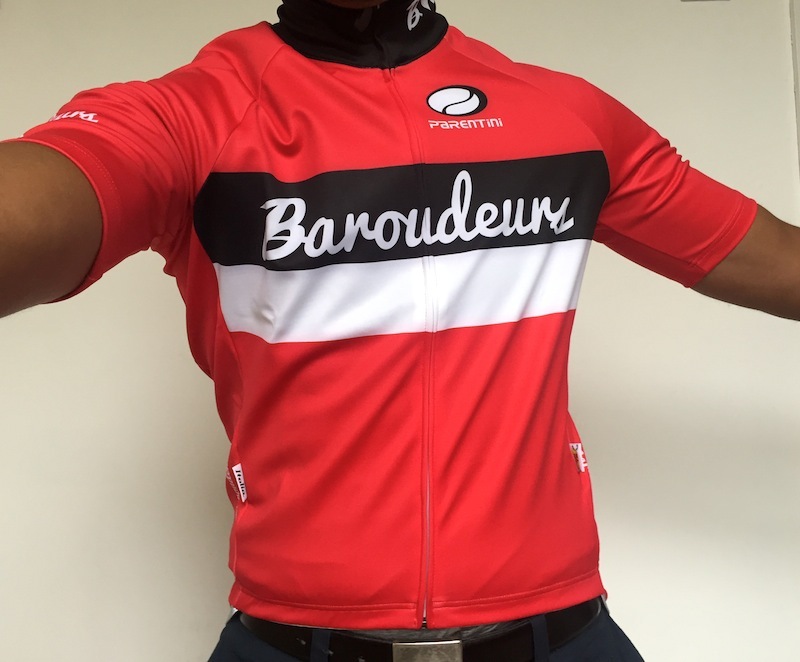 Personally, this makes for a rather awkward fit where I regularly find myself having to pull the jersey down (from the bottom) so that it sits squarely across my shoulders, rather than riding up. Would I get one again? Functionally, I think it’s great. Whilst not a regular rider in the rain, I don’t think the Mossa faired that much different to what the Gabba would have given. I stayed relatively dry from the outside elements (apart from the seams, which is to be expected), and I didn’t get cold at all. I can’t comment on repeated rides, and longevity of it, so would leave that to someone else. Another big plus is that for the money, it’s very good. To get a functional garnet such as the Mossa in our *club design* for less than £100 is exceptional. I can imagine the equivalent in Castelli probably costing double that. Would I recommend the Mossa to other members of the club? I would say yes, but you need to try it on to ensure the fit doesn’t put you off. 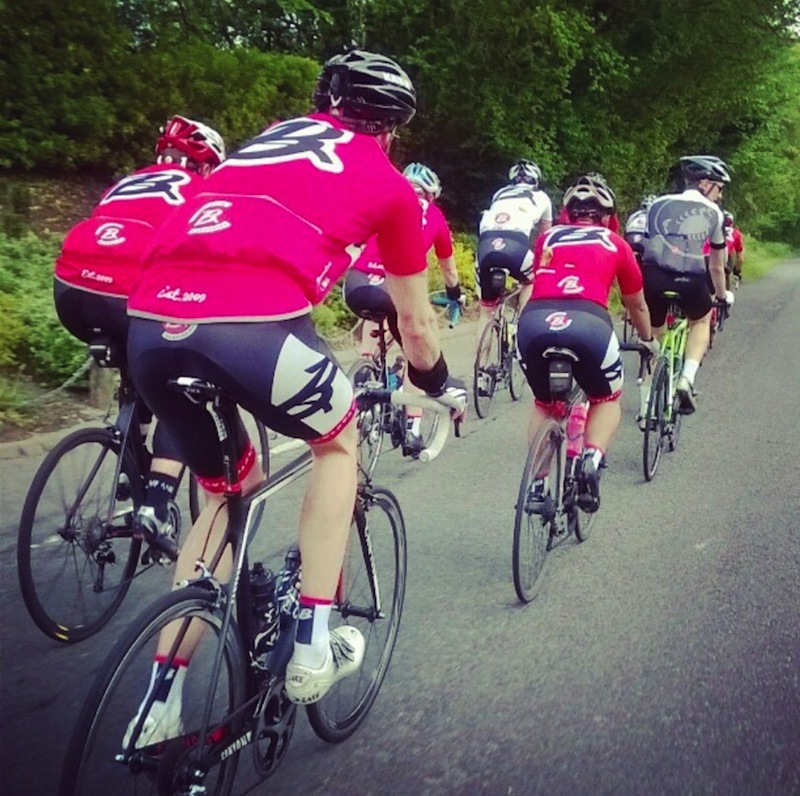 We unanimously agree that the Mossa v.1 works as a customised team kit. With excellent workmanship; regularly drawing interest from people we meet on the road, especially when coming in from a storm. However, it divides us as to whether we would continue having the Mossa v.1 as a mainstay of our wardrobe. Half of us love it, the other half hide it in the back of the cupboard. And this comes down to sizing. Despite having tried our very best to order the recommended size, some of us are still confused by the cut. This isn’t all bad, because we quite like our gilets and other pieces of kit. Is it, or isn’t it waterproof? Yes, we do agree that the Windtex material is fully waterproof, but without taped seams, the rain, in our part of the UK anyway, eventually finds its way through after a couple of hours. It’s nothing close to a soaking that will freeze you, but enough to make you head home, and insist that this be resolved. What it does well is taking care of your core temperature when riding at tempo levels or above. 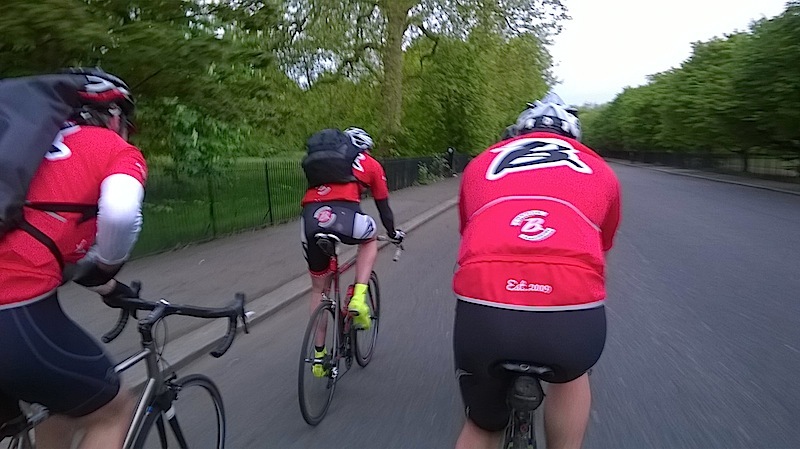 On the outside, anything above 9ºC and you’ll want to swap it for a standard jersey. With over 6 months of regular use, across 3 seasons, the Mossa retains its form and looks like new after each wash. 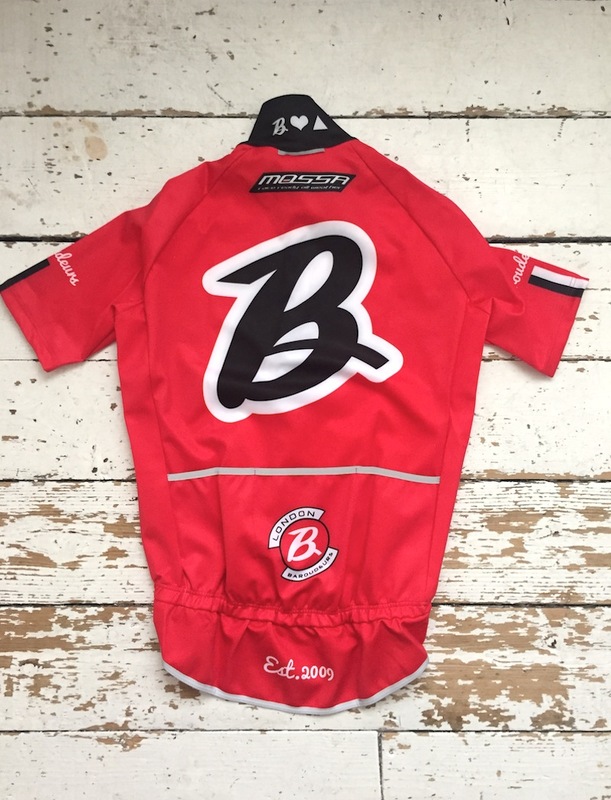 When you consider that the design proofs didn’t match the final product – the inside of the collar is white, when it should be black, and the ‘B’ on the pocket doesn’t match the ‘B’ above it, you have to wonder if a small entrepreneurial outfit that didn’t get the details right, can ever match the likes of Castelli and slay the Gabba? We do hope so, because they’re definitely moving in the right direction. So, if you want to take the worry out of what to wear in foul weather, consider the Mossa as a very good option, but try it on first. And if you’re customising for your team, ensure you get written confirmation on all your designs. We haven’t got our hands on v.2 to look over the improvements, but it looks like Parentini are listening to its customers and are addressing the concerns we’ve mentioned above. Thank you, BFJ, Boony, Captain, Cosmic and EG for your help in putting this together. What’s been your experience with the Mossa? Leave your feedback in comments section below. Thanks! Hi Guys, thank you for the detailed review of the Mossa. Just to confirm the Mossa has been lengthened from the front, the zip has been covered to prevent any frontal air penetration. as for the white collar, this seems like a misunderstanding and error for which we apologies sincerely. Please note if you ever in doubt between two sizes go for the smaller one. in some of the photos in he article, the Mossa seems little too big, please note the elasticity if the Mossa [ as you mentioned] is very high, this allows you to wear it very snug and insure close contact with the body for quick sweat transfer from the body outwards. 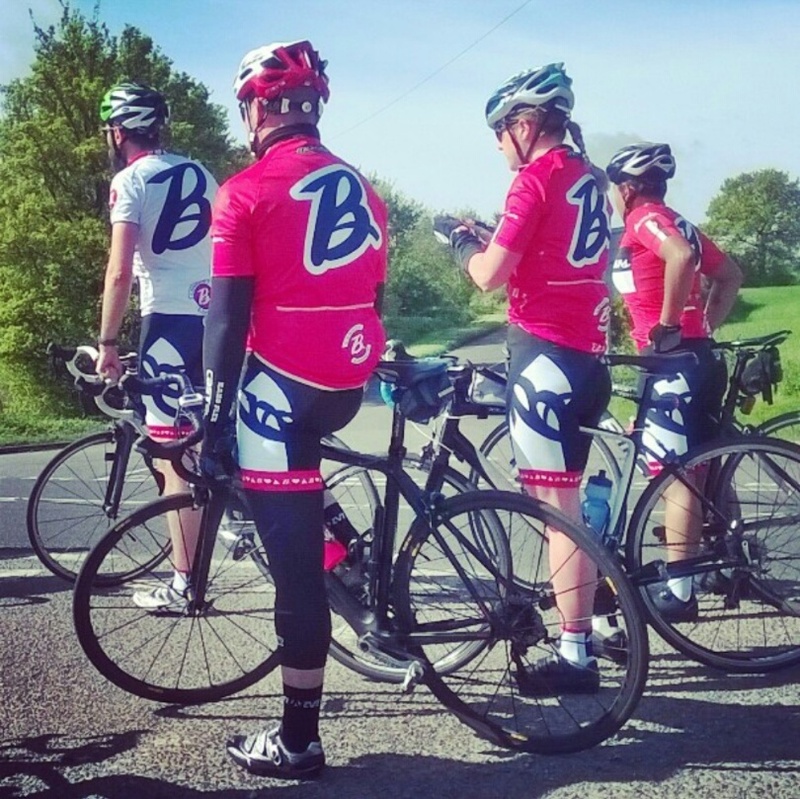 Not sure if i someone in the article mentioned wearing the Mossa without baselayer! 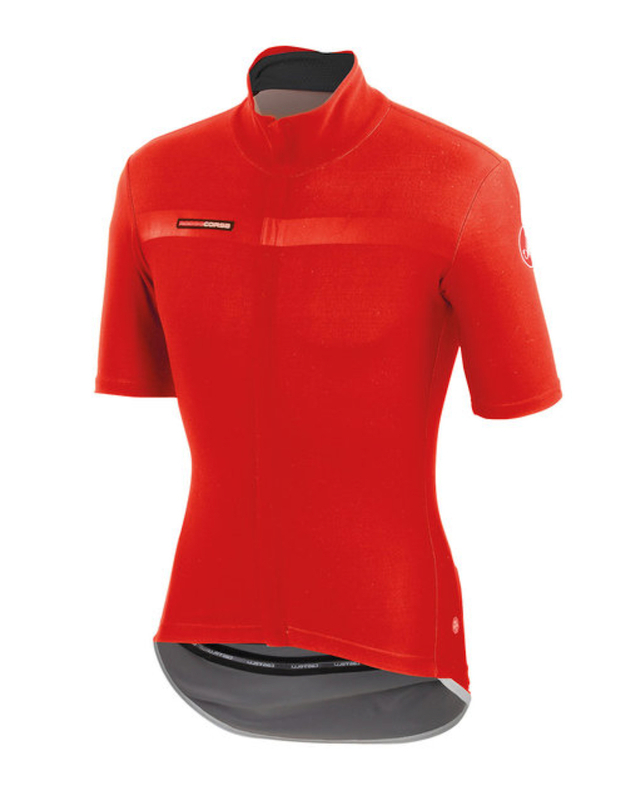 the Mossa is to be worn always with baselayer of Polypropylene and not polyester base. merino wool is fine for very cold weather however it will retain the sweat on the body and result in getting cold. With regards to taped seams,Termosaldato process-applying heat to the seams to seal – will make the seams rigid and the Mossa will lose big part of its elasticity, the water at no point remains still on the seam to go through, if you getting water in, its highly likely from the neck through the helmet, it will take hours for the water to be still over the seam to start dripping through it, in microscopic amount though. 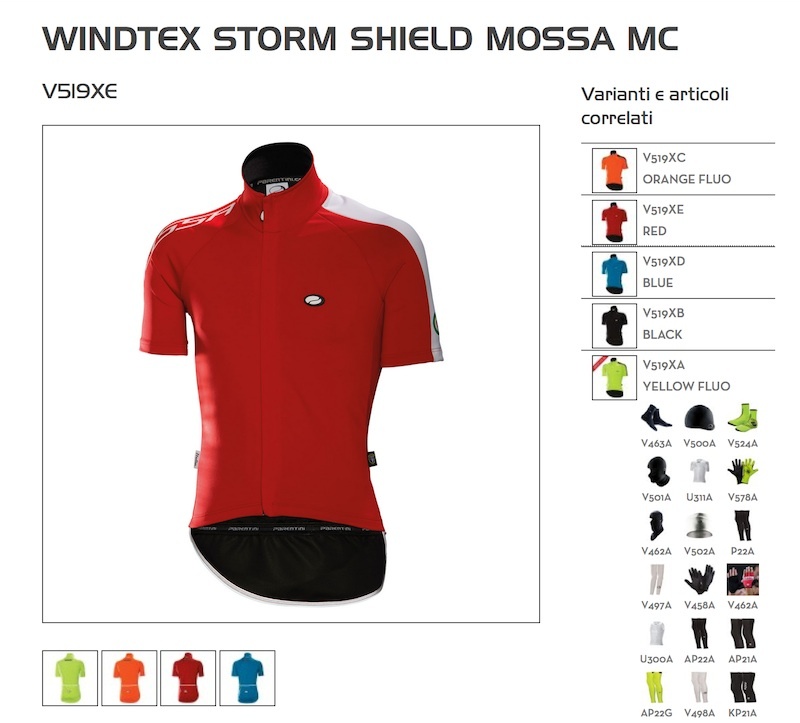 very important aspect to the Mossa, is that the Windtex Stormshield is a system not just fabric, the way it regulates the body temperature and controls the sweat release keeps you warm even if you had some water coming through is very heavy down-pour. that’s due to the Mossa being warm as a cape, the Mossa fabric retains the heat released by the body and lets evaporate at steady pace, this means the outer shell covering the body is forming a warm environment for the body to remain DRY yet warm. 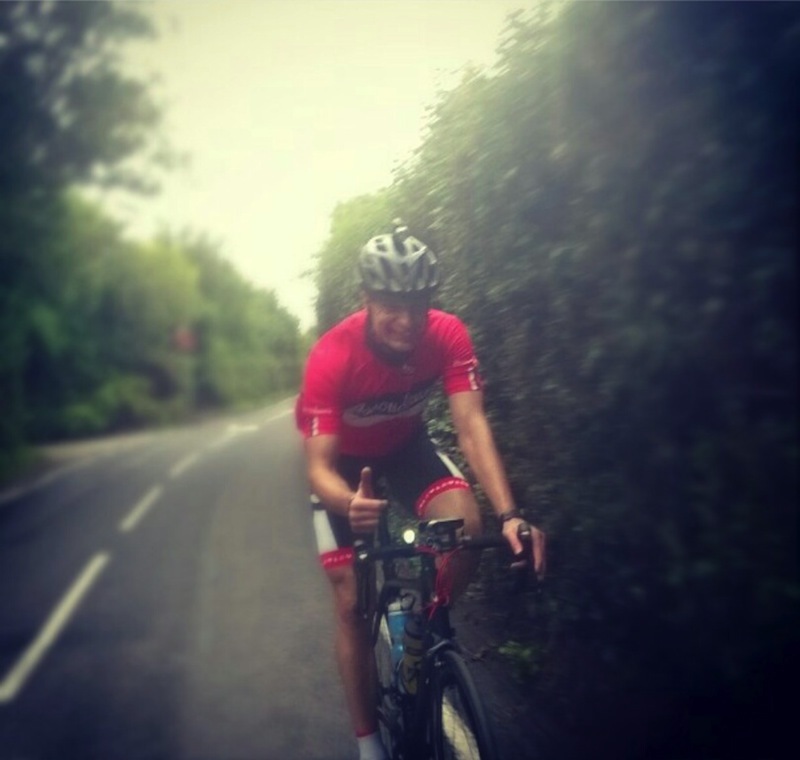 As one rider said, once you put the Mossa on, you don’t need anything else, no Gilets, no rain capes and no jackets. also its so light you forget you have it on. 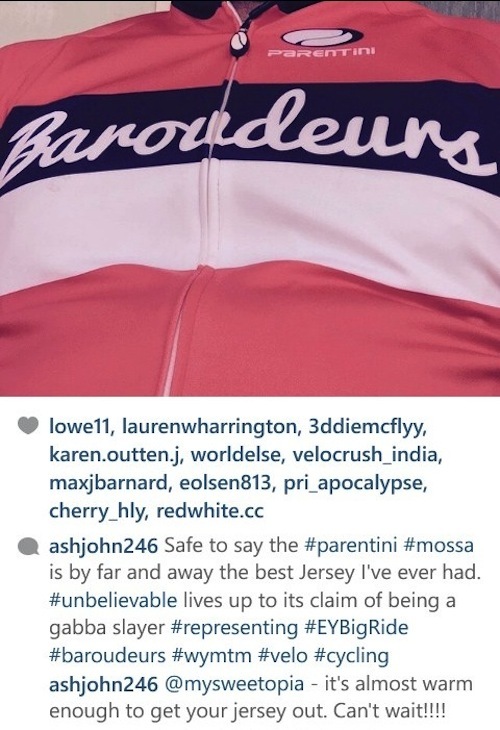 We wish you safe and happy riding with the Parentini Mossa.